Concept and detail engineering of analyzer projects, tailored to every industry’s specific needs and even to individual needs, is incorporated in the unique AppliTek idea of manufacturing turnkey solutions. It is our experience that many applications require analyzer shelters and cabinets to guarantee stable operational conditions and/or compliance with safety requirements (Ex zone). Other applications require a thorough application knowledge combined with the design of dedicated sampling systems. For more information on what exactly we can engineer for you, please check the details under System integration. A fast emerging number of satisfied users worldwide appraise the unique AppliTek symbiosis of know-how and expert teams in various domains. The starting point of each project is our analytical expertise, fulfilled by our Application department. 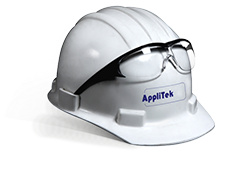 AppliTek has a track record of almost 30 years in the analytical business thanks to an extensive experience in most analytical techniques. The results are enhanced flexibility, improved Return On Investment (ROI), a minimum of downtime and increased production figures.